TO PURCHASE TICKETS TO OUR ANNUAL CHRISTMAS CONCERT "SALVATION IS CREATED", CLICK HERE! The choir is available for sacraments, including baptisms and weddings. To view the Music Wedding Package, Click Here. The Cathedral Music Ministry has a rich history of adding beauty to the Cathedral worship experience, performing the music of composers such as Theodore Bogdanos, Anna Gallos, Alexander Gretchaninov, Dimitrios Pappas, George Raptis, Nancy Takis, Tikey Zes, and many more, in addition to arrangements by the late Maestro Dr. Dino Anagnost, music director of the choir for many years. The renowned Cathedral Choir, formed by a core of music professionals and volunteers, is featured most Sundays at the Archdiocesan Cathedral. Along with superb execution of the liturgy every Sunday, the Cathedral choir also performs concerts throughout the year bringing the surrounding community to our parish as a witness to the beauty of Orthodox Christianity. The 2018 Cathedral Christmas Concert is scheduled for Friday, December 14th 2018, at 7:30PM. The Archdiocesan Cathedral also features music rehearsal spaces that can be rented to accommodate large and small groups, ensembles, choirs, orchestras and more. Each space is equipped with piano. 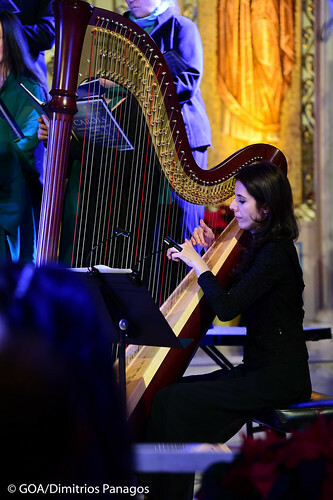 For more information, please e-mail Associate Director Of Music Costas Tsourakis, costa@thecathedralnyc.org. If you would like to join the Cathedral Choir and be part of the Cathedral Music Ministry, please email choir@thecathedralnyc.org.